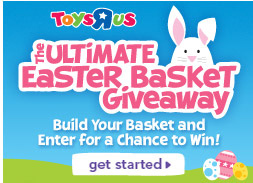 Toys R Us Ultimate Easter Basket Giveaway - Enter to win 1 of 25 pre-filled Easter Baskets. 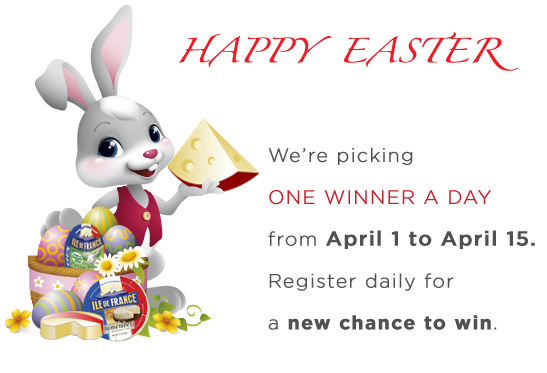 ILE de France Cheese is having an Easter Contest for 1 winner a day until April 15th to win free cheese! Super simple entry. Your newest follower via the I Love Monday Blog Hop. Thank you! HI! I'm your newest follower via the I Love Monday blog hop! Stop by Always JUSt A Mom and check us out! New follower from I Love my Online Friends blog hop! cute blog! Hello, just visiting from I LOVE MY ONLINE FRIENDS MONDAY HOP. I love the blog. Hope you can come over and visit me. Following from "I Love My Online Friends Monday Hop". Looking forward to learning more about you! Come by and follow me back? Hi there! Following you from the blog hop. Would love it if you could come visit us at Random Deals. Thanks!